Red and white fantail goldfish are a beautiful and easy to care for species. Fantails are recognized by their deeply-forked double tail fins and round body in shades of pearl white and brilliant orange. Inexpensive to obtain, these fancy goldfish are ideal for beginners. While the image of a goldfish kept in a little bowl is common, a tiny bowl is never a suitable home. Fantail goldfish grow to up to 8 inches. Not only do they grow large, but they produce a lot of waste. In a tiny bowl, a goldfish will be cramped in filthy water. To keep one fantail, you’ll need a minimum 20-gallon tank. For every additional goldfish you want to keep, add an additional 10 gallons. To keep 4 fantails, you’ll need at least a 50-gallon tank. Make sure its equipped with a good filter, at least large enough for the size of your tank. 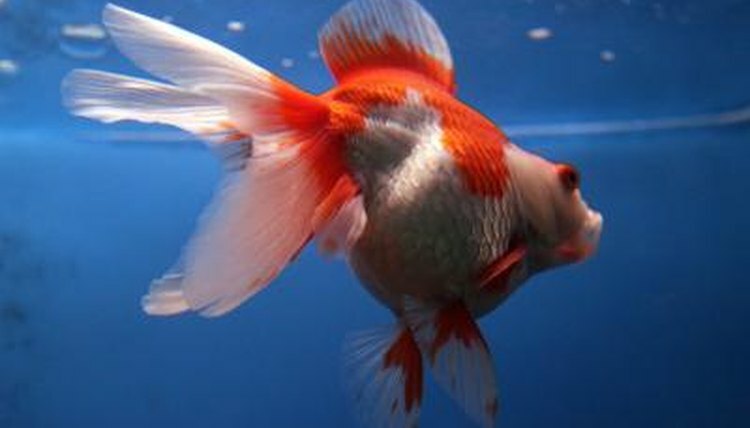 Since goldfish are so messy, getting a larger filter, for example one designed for a 50-gallon tank but placed in a 30-gallon tank, is always better. Unlike tropical fish, fantails are fans of colder water in their tanks. Unless room temperature in your house dips below freezing, there isn’t any need for a heater. Keep the tank away from direct sunlight, as goldfish become very stressed above 86 degrees Fahrenheit. Goldfish can survive low temperatures just above freezing, so if you lose power in the winter they’ll likely be alright. The ideal temperature for your goldfish is in the 70s, so room temperature is ideal. Make sure to add a bubble stone to ensure there is sufficient oxygen in the tank. It’s tempting, especially if you have a large tank, to add some different fish in with your goldfish. Goldfish aren’t tropical fish and prefer cooler water that wouldn’t be healthy for tropical fish. Goldfish also will eat any fish small enough to fit in their mouths. The best tank mates for goldfish are other goldfish. Since fancy goldfish, like fantails, are slower swimmers than common goldfish, like comets, fancy goldfish should be kept only with other fancy goldfish. If you want to get another goldfish as a pal for your fantail, consider a black moor, oranda or ryukin goldfish. When feeding your goldfish, some care should be taken. Goldfish don’t have stomachs and will continue eating as long as there is food in their tank. Feeding a goldfish too much can be fatal. Feed your goldfish two or three times daily, only enough food that they can eat in one minute. Remove any excess food from the tank. Always feed your fantail food that is designed for goldfish. Tropical fish food can be too high in protein and carbohydrates. If you choose a pellet-type food, which won’t degrade as quickly as flakes, make sure the pellets are small enough to fit in your fantail's mouth. The Goldfish Tank: Do Goldfish Need a Big Tank? The Goldfish Tank: What Do Goldfish Eat? What Is the Food & Water Requirement for a Hamster?